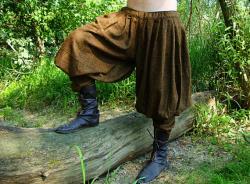 Early medieval viking baggy trousers / baggy pants - pasbyxor. 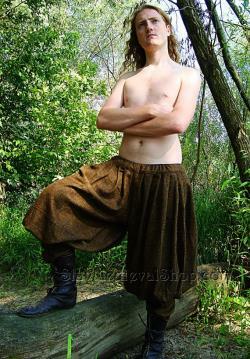 Trousers are known from runestones in gotland, also during excavations in the emporium hedeby they discovered the remains of trousers, which are interpreted as pasbyxor. Based on the sources of the historical museum in stockholm. Pants were sewn by machine - all the internal stitches are not visible on the outside of the garment. All visible stitching are handmade. One size fits allwidth of leg is 59 inchestotal length of trausers - 39 incheswaist: 47 inches (fits size 48-60 because it has a belt).